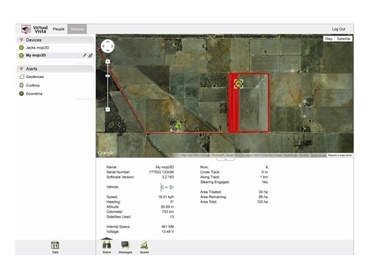 Leica Geosystems has introduced Virtual VistaTM, a new web based platform that delivers a flexible data management solution to farmers. Virtual VistaTM offers a simple solution which connects directly to the Leica mojo3D. Through the built-in modem of the Leica mojo3D farmers can access the service within a few steps; no additional hardware has to be purchased. Initially Virtual VistaTM provides users with a convenient overview about activities in the field. It enables customers to monitor their fleet by combining real time and historical information with the use of Google MapsTM. Features such as geo fencing and curfews allow a new level of fleet management and can be easily activated with just a mouse click. What sets Virtual VistaTM apart from other online farm services is its simplicity. Users don’t need to manage a complex menu structure to use the service. The intuitive design of the platform ensures an easy understanding for a best possible user experience. The success of Leica Geosystems has been built on innovation. In 2007, Leica Geosystems changed the agricultural guidance scene by introducing Virtual WrenchTM, the agriculture industry's first web based remote service, support and diagnostics tool, which reduces costs associated with downtime. “We see Virtual VistaTM as the next logical step, delivering additional user benefits from the built in connectivity of the Leica mojo3D. We believe that providing customers with online access to their devices will bring new efficiencies to guidance systems. It will influence farmers on the same scale like mobile phones, leaving us wondering how we ever did without them.” said Robert Johnson, Product Manager at Leica Geosystems Agriculture. The power of Virtual VistaTM is set to grow throughout 2013 with more innovative features primed for release. These updates will automatically become available to all registered users of the platform.